Spinnaker Industries Inc. Model Series SPOAU 100% Outdoor Air Systems are factory assembled, wired and tested prior to shipment. SPOAU systems are a complete Heat / Cool single package or split systems with solid state controls factory installed, and wired. All models are available with a choice of options including; gas, electric, hot water, or steam heat and chilled water cooling or self contained modulating DX cooling with a complete refrigerant R410A charge. The Solid State Electronic DDC onboard Control System provides unlimited flexibility in application and system design and un surpassed control of temperature and humidity. SPOAU systems make it possible to specify a complete rooftop packaged or split system from one manufacturing source. 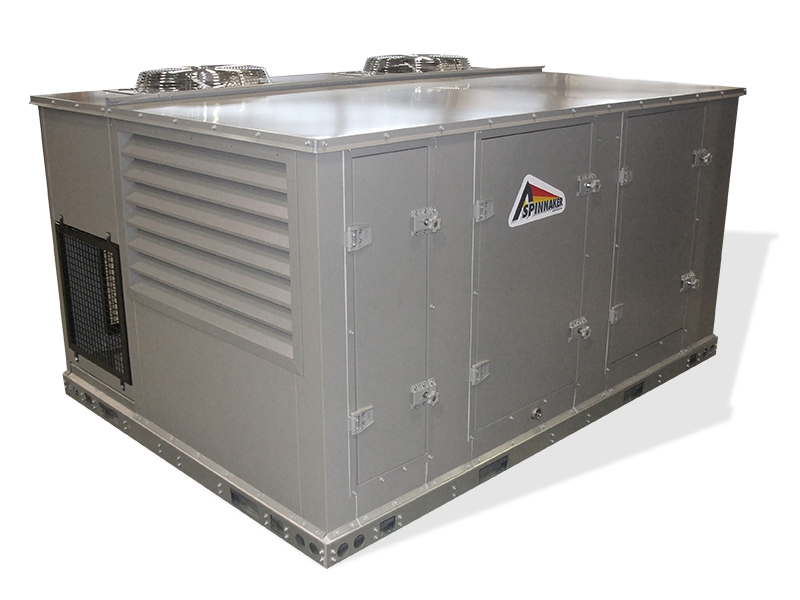 The modulating DX cooling system consists of single or multiple refrigeration circuits utilizing fixed scroll compressor technology and modulating hot gas by pass affording the maximum in energy efficiency thru the cooling range. Independent condenser fans utilize TEFC high efficiency motors and are driven by variable frequency drives.